An elegant tall growing tree Corymbia maculata is one of a number of species commonly called the ‘Spotted Gum’. It is most easily identified by the smooth dimpled trunk, usually straight, white to cream in colour and with grey to pink markings or ‘spots’. Foliage is a deep green, long and narrow. From late summer to winter the tree is covered with masses of white flowers. The flowers are fragrant, attract bees and the honey produced is prized. Previously all Corymbia species were listed as Eucalypts, however things have changed and this useful group of landscaping plants now has its own genus with around 100 species and sometimes called ‘ Bloodwoods’. Different species require different soil conditions, many require well drained soils, a few will grow well in poorly drained soils. 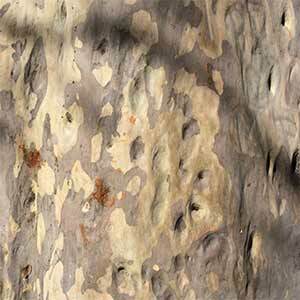 Corymbia maculata derives its common name from the spotted and dimpled trunk. 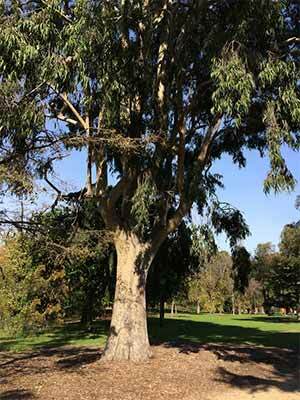 The spotted gum is a tall ( 15 – 40 metres plus) strong growing tree, with attractive dark green foliage. Originally from the coastal and foothill areas of Southern New South Wales, Corymbia maculata is fairly drought tolerant once established however it does need some protection from heavy frosts when first planted. This is a tall growing tree easily reaching 40 metres plus. In cultivation it requires a sunny open position and a well drained soil. Position – Best in full sun it will grow in part shade between buildings.. Offered by wholesale growers from tubestock to small specimens C. maculata may require some protection from grazing animals in early stages of growth as well as some extra water through the first summer. Planting in late summer to early spring is recommended. Use Corymbia maculata as a feature tree in a position where its attractive trunk can be appreciated. It makes a good large shade tree in larger parks and gardens. This is a species that tends to hold its limbs better than some others. The timber is also sought after for use in furniture, decking and other applications. Height 15 – 40 m occasionally taller. Flowers – White, but held on the high foliage and not usually seen, followed by gum nuts. Corymbia maculata or Spotted Gum is available from the following wholesale nurseries.